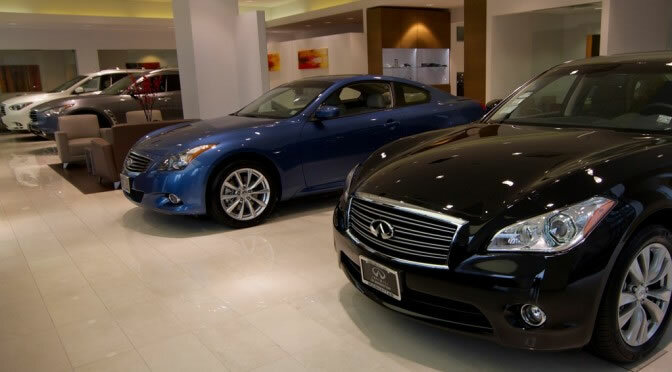 Do you want to get the best price on your vehicle purchase. here are some tips that will help you. In February and August sales usually remain slow because buyers wait for the new number plates coming in March and September. If you want to take advantage of this quiet period, your old number plate will make your car look older than really it is, but you can have an impressive deal on the outgoing number plates. In June and December quarter ends, the dealers usually remain keen to hit their quarterly sales targets and more likely to offer you a good deal. Convertibles are more desirable in the summer, but they are good bargains in winter. The demands for 4 wheel drive remains in peak during poorer weather seasons. Here is a picture of the collapsed Bridge On Route 9 over Riviere Grise. The population has managed to adjust to the new reality. A bridge along Route 9 in Cite Soleil partially collapsed on March 18, 2016 at around 8:30 am at the passage of a dump truck carrying gravel. About two months after the collapse, the US Army Corps of Engineers was engaged to assess the condition of the bridge and determine possible causes of the collapse. As per their reports, it was revealed that the bridge built in 1997 by the U.S Army was designed to withstand a load capacity of 30 tons, but it used to carry regular loads beyond 40 tons. Every day, about 12,000 vehicles used to cross the bridge before the collapse. Poor maintenance, overloading, existing damages and lack of supervisions were the possible causes of the collapse. The investigating team has recommended that the Olympic Park side (North side) of the collapsed wing and the side of Cité Soleil (South Bay), unaffected in the collapse, both should be replaced by similar modular steel with increased load capacity. 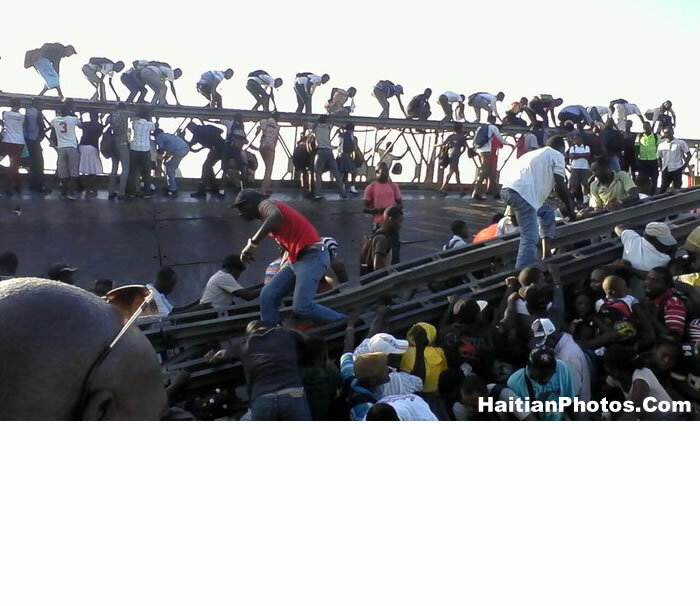 Here is a picture of a collapsed bridge in Cite Soleil along Route 9 in Haiti. 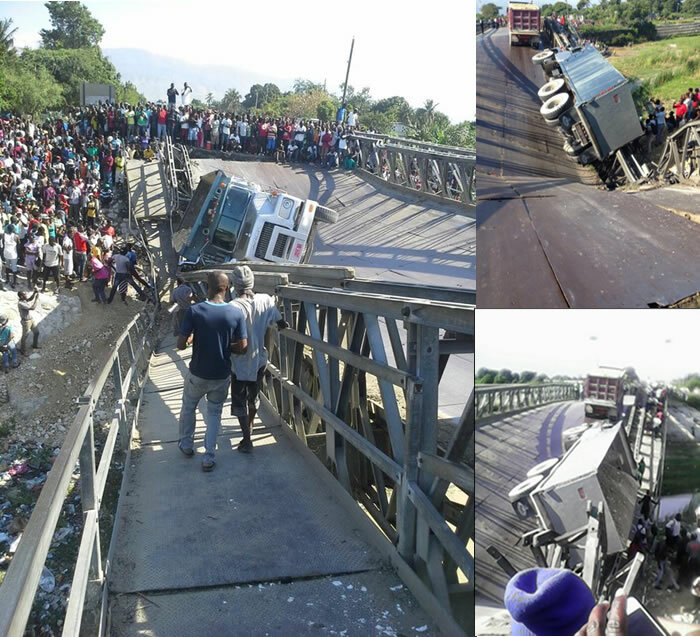 The recent collapse of a bridge (Wout Nave Bridge) on Rivière Grise shows how poorly Haiti's road system is planned and managed. The bridge partially collapsed on March 18, 2016 at around 8:30 am at the passage of a dump truck carrying gravel. This structure used to carry over hundred heavily loaded trucks everyday that was built to support a load of twenty tons only! An investigation suggests that another possible cause of the collapse could be the stolen bolts of the bridge which were found missing. The accident was predictable as this twenty year old structure was never maintained properly by the Ministry of Public Works. Here is a picture of the Bridge on Route 9 over Riviere Grise that collapsed in March, 2016. 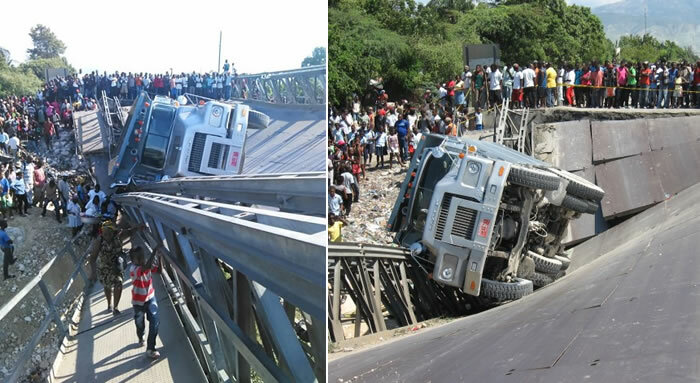 On Friday, March 18, 2016, a bridge over Rivière Grise on Route 9, connecting Cité Soleil to the National #1, partially collapsed while a truck was passing carrying gravel over the bridge. It was a metal bridge, 62 meters long and 20 meters wide. Surprisingly, everyday, over hundred heavily loaded trucks pass over this bridge which was built to withstand a maximum load of twenty tons only! No casualty was reported. Signs of road diversions have been posted. 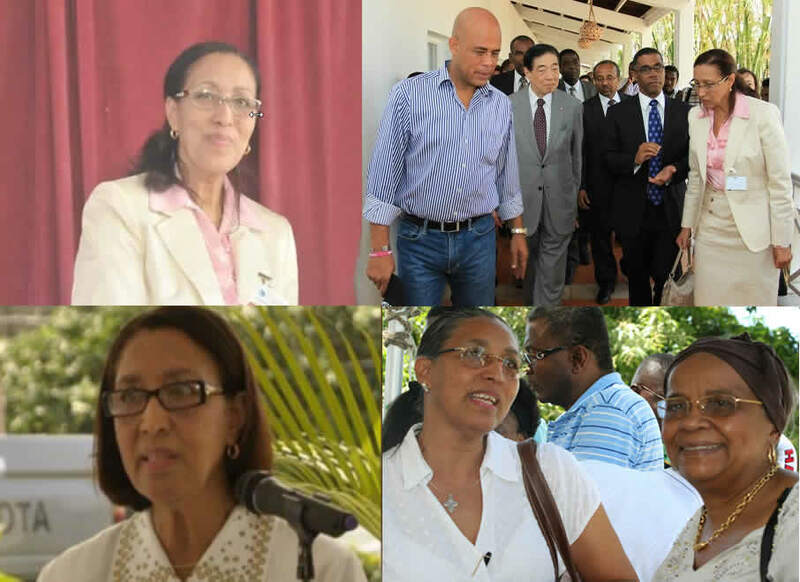 This recent disaster is an example of poor quality craftsmanship and supervision and that indicates how the public money in Haiti is managed. A primary investigation suggests that the possible cause of the collapse could be the stolen bolts of the bridge which were found missing. 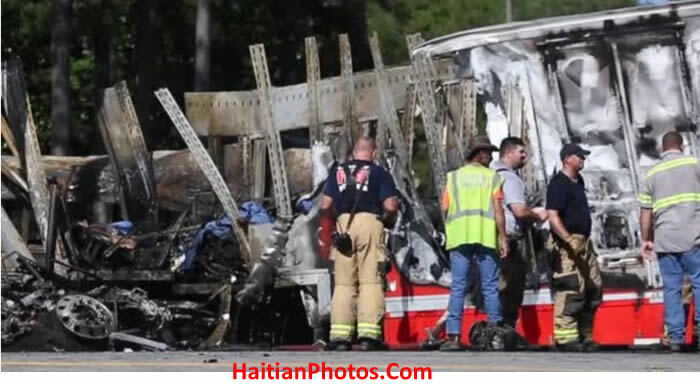 Here is a picture of the first bus prototype Made in Haiti by Jean-Paul Coutard. As part of luxury and comfort, it is equipped with 54 reclining seats, televisions, sound system, custom lamps and sanitary facilities. Once an assembly plant is established, the cost of the new production will be much less. Earlier to the 'Haitian Pride', transport system in Haiti was very much inadequate-- when it was available--was prohibitively expensive for most citizens. 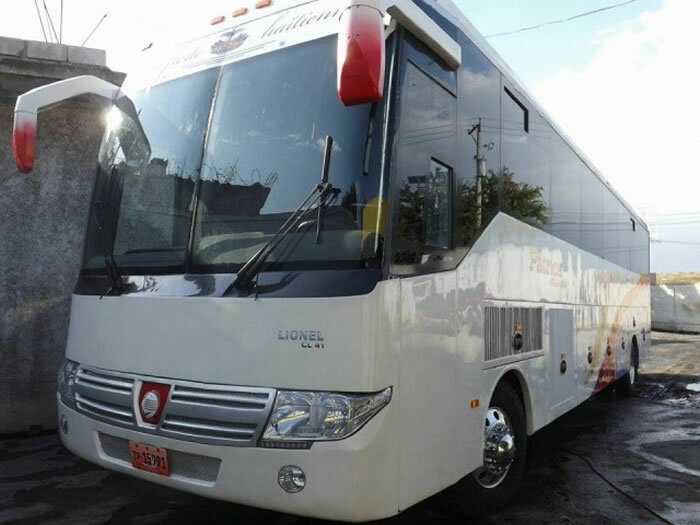 During the inauguration of Rene Preval, the buses used for the occasion were all imported from the Dominican Republic. Jean Paul Coutard took this as a national insult, because he felt that his country must not be so poor and unproductive that it could not even produce its bare essentials. He inherited a love for motor mechanism from his father who was a commercial truck driver. 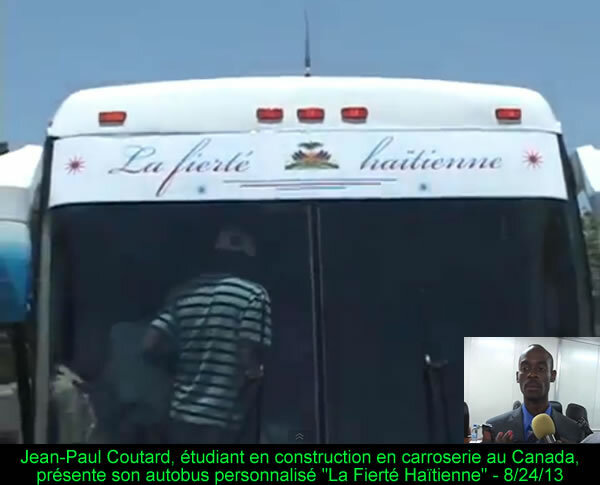 Coutard Motors S.A.it to introduce its second bus made in Haiti. Jean-Paul Coutard is an ambitious, independent thinking entrepreneur who has changed the transport system in Haiti. Without any bank finance, he did not fear to spend his entire resources to fund his dream project-- the first prototype bus made in Haiti. 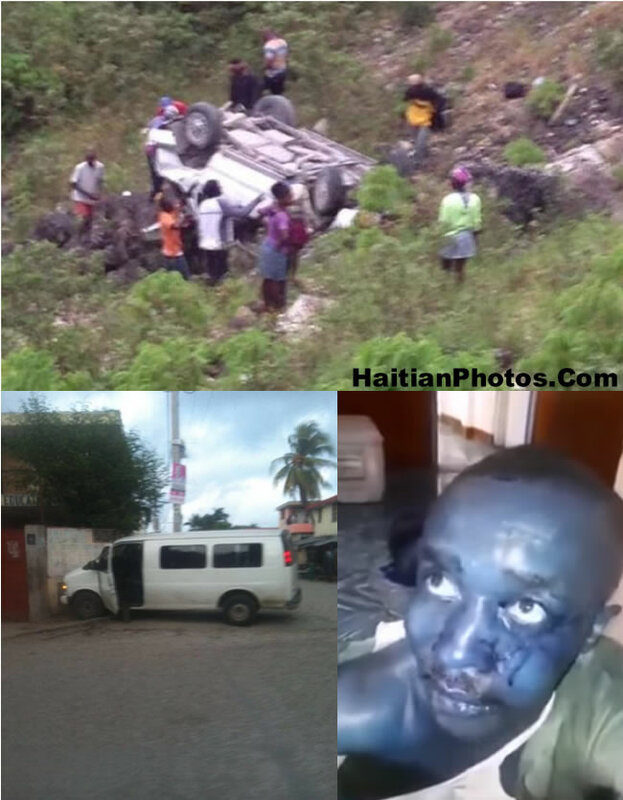 At the age of thirty, following a five-year study and two years of work, he designed the first Haitian Bus Transportation named "La fierté Haitienne" (The Haitian pride). To realize his childhood dream, he accumulated $160,000-- exhausting his entire savings, he even had to borrow from his family and friends. 'The Haitian Pride' is equipped with a 300-hp diesel engine and double chassis. A rear view camera gives the driver a clear view and better control over the bus.